TIBURON, California, September 10. YESTERDAY some of the world's most elite open water athletes took a chilly plunge into the 61-degree waters in Tiburon, California. 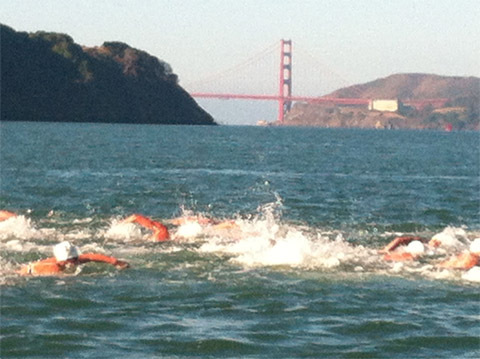 The mile-long race, starting at Angel Island and ending on the docks of Tiburon, is considered a sprint in the world of open-water swimming. 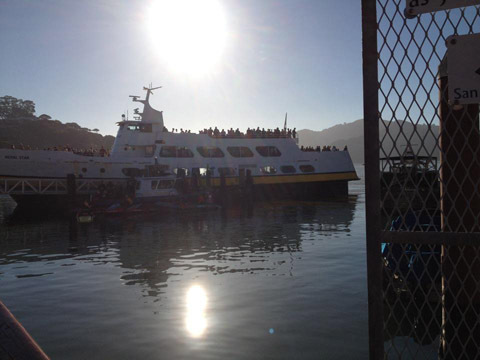 At approximately 8:30 in the morning, 200-plus athletes filed on to two ferries from the Tiburon docks, heading to Angel Island. Apart from the ensuing race, the main topic of discussion was the incredible, sunny weather: no morning bay fog, and just a slight breeze. The boat ride to the island was quick, but it provided dramatic views of the San Rafael Bridge to the left, and all of San Francisco and the Golden Gate to the right. Joining the fun was a pod of harbor porpoises, poking their heads to the water's surface, checking on the commotion. The time approached 9 o'clock; the athletes filed off the ferries and made their way to the shoreline. While a couple brave souls swam out into the harbor water, acclimating to the cold, members of the California Golden Bear swim team gave a raucous cheer from the beach. The gun went off, signaling the start of the race, and the elite group raced into the water. The lead boat followed them closely, filming the battle. Cameramen leaned precariously over the boat, dipping their cameras into the water as the small pontoon bounced up and down with the swells. Four or five swimmers immediately broke off from the rest of the pack, hugging the Island coastline. Kayakers paddled around them, making sure no one veered too severely from the group. Radio chatter punctuated the sounds of water slapping the sides of the pontoon. Make sure he doesn't go too far to the right. Slow the boat's engine; you're causing a swell. Pull the boat up closer. The boat pulled in tight with the athletes, furiously fighting each other, the cold water, and the clock. From a straight-line view, the elite group women's leader, Melissa Gorman was in the lead. Gorman was the women's 2011 and 2009 RCP Tiburon winner, earing the grand prize, $10,000, on both occasions. As the athletes approached the finish line, the two lead men, Kane Radford and Ridge Grimsey, pulled ahead of Gorman. Ten meters from the finish line, the tight group of athletes thrust themselves from the water, struggling to regain their legs. Radford, the 2011 and 2009 RCP Tiburon Mile winner, broke the tape first with a time of 21:43. The New Zealander beat second-place Grimsey by two seconds, and third-place Gorman by three. Gorman came out with the win for the female elite group, taking her total-career RCP Tiburon winnings to $30,000. This amount ties with Radford, as both swimmers have won three RCP titles, all in the same years (2012, 2011 and 2009). Second place for the women's elite went to Christine Jennings, at a 21:51. Mission Viejo's Ashley Twichell and 14-year-old Becca Mann tied for third at a 22:09. After shakily greeting the media at the finish line, the majority of the elite group tottered back into the cold water, shaking the lactic acid from their limbs, and slowly swimming several yards out and back from the dock. Male winner Radford made his way to the pier's upper deck, seeking medical attention for his sliced right foot, which he injured a day prior to the event. The morning concluded with the hungry athletes congregating in a 60-foot food tent, filling their plates with a breakfast burritos, sandwiches, lasagna, fresh fruit and coffee. They lounged on the cool grass picnic-style, facing an open-air stage with live music. It didn't hurt that San Francisco in its entirety was the backdrop.